Russia's solo project Astarium have returned with a new recording that continues the symphonic style of occult black metal from previous releases and this is a review of his 2016 ep "Epoch Of Tyrants" which was released by More Hate Productions. Ocean sounds along with some synths and clean guitars start off the ep and after awhile programmed beats are added onto the recording and on the second track the music goes into more of a heavier and symphonic direction as well as introducing melodic guitar leads onto the recording. When the music speeds up a great amount of blast beats can be heard along with the tremolo picking giving the songs a more raw feeling while the vocals are mostly high pitched black metal screams with soem grim touches and the music is very heavily rooted in the 90's. Throughout the recording you can hear a great mixture of slow, mid paced and fast parts and you can also hear all of the musical instruments that are present on the recording and some songs also bring in a small amount of war samples and a couple of the tracks arevery long and epic in length as well as bringing in a few instrumnetals. 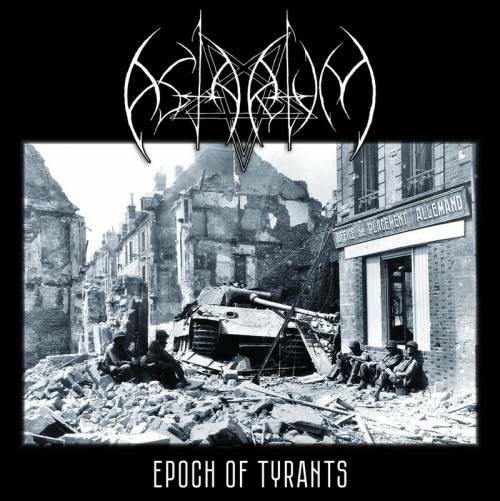 Astarium creates another recording that remains true to the symphonic style of occult black metal from previous releeaases, the production sounds very powerful while the lyrics cover War, Satanism and Occultism themes. In my opinion this is another great sounding recording from Astarium and if you are a fan of symphonic and occult black metal, you should check out this ep. RECOMMENDED TRACKS INCLUDE "SS (Satanic Squadron)" and "In The Twilight Of The Gods". 8 out of 10.